I last talked about Big Brother in September 2014. That article was, for all intents and purposes, a celebratory piece on Derrick Levasseur, the man who single-handedly dominated Big Brother 16 through a mix of manipulation, subterfuge, and intellect. In that article I also talked about what was wrong with Big Brother 16 (ahem, Frankie Grande). But for all of the warts in that season, none of them compare to the carbuncle that is Big Brother 19. If you were to squint into the sun for a minute (don't do that) and then look at Big Brother 16 and Big Brother 19 from afar, both seasons might look relatively similar. At their core, 16 and 19 feature a dominant manipulator (Derrick and Paul, respectively), who has all of the other houseguests eating out of the palms of their hands. But that is where the similarities end. Big Brother 19 fails because the vast majority of the remaining houseguests are miserable people. 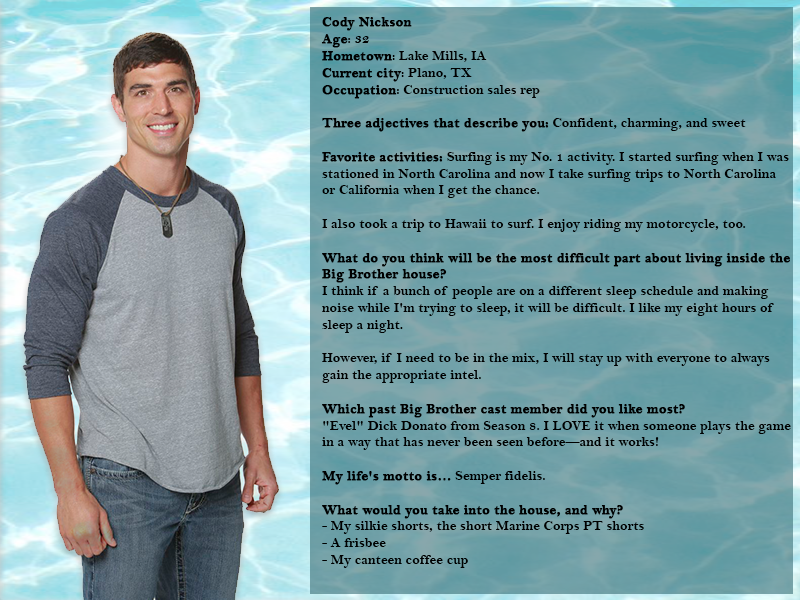 So miserable, in fact, that Cody Nickson, the man originally considered by many to be this season's unlikable villain, is now likely to win America's Favorite Player. What explains Cody's rapid rise in popularity? The simple explanation is that seven of the eight people left in the house, all of whom Cody was aligned against, are overwhelmingly unlikable. To hammer this point home, it would be best to address each of these people individually. Paul: Paul is playing a great game, to be sure. Despite the fact that he is responsible for encouraging his sheep to harass other players, he is, at the very least, still playing for the 500K, which can't be said of some of the people he's playing with. What can't be defended is Paul's irrational hatred of Cody, which in large part is what turned this season into the circus it is today. Paul used his cachet as a Big Brother veteran to rally the house into a frenzy against Cody, and used the ensuing chaos to secure a position of power in the house. This would be fine were it purely a game move, but Paul seemed to derive genuine pleasure from making Cody and Jessica's lives miserable. Christmas: Perhaps her name should be "Cognitive Dissonance" instead of "Christmas Joy." Christmas is so sure of her own intelligence that she doesn't even realize that every move she has made has been choreographed by Paul to further his agenda. Furthermore, she believes herself to be someone who goes after bullies, not realizing that she's one of the biggest bullies in the house. The way she cornered Mark alongside Alex was hard to watch, and her proposed tactic of trying to get Cody to self-evict via triggering his PTSD was despicable. Josh: Josh had some potential as a player, but generally speaking, he's squandered it by fulfilling the role of Paul's lapdog. Paul uses Josh as the point man in his master strategy this year, which is to turn the entire house against his targets through constant berating and bullying. Josh's antics have been painful to watch. Already he's pushed two people, Mark and Kevin, to the brink of wanting to knock him out on live TV. And really, I can't blame them. Josh's one saving grace is that he seems to be the only person left in the house who is mildly suspicious of Paul's gameplay. But given how this season has gone, it's doubtful that he does anything to usurp Paul's throne. Alex: Alex has received a nice edit from CBS, which is unfortunate because she's one of the most mean-spirited people in the house. Just these past few days she's encouraged people to go after Kevin for being "old and fat." She's also thrown out his food. In fact, she seems to enjoy spreading misery, as evidenced by her petty confrontations with Mark, Cody, and Jessica over misplaced pillows, a box of cereal, and her "cat ears." And much like Christmas, she believes that she is running the game. She has no inkling that Paul is simply using her as a tool to incite suspicion and outrage towards whoever his current target is. Jason: Jason is a few ticks away from being someone you'd want to root for. But every time he does something good, he throws it all away by making a disgusting joke involving women and what he'd like to do to them. I don't know if that's just his sense of humor or if he really does have a black heart, but sometimes it's hard to tell. The fact that he blindly follows Alex is also revealing of his inability to think for himself. Matt: Not much to say. He's useless in terms of the game and seems to be happy playing for 8th place. He's never made a single move unless you consider courting Raven a "move." If he gets evicted today, good riddance. If anything, it's a shame that he took up a spot that would have been better filled by day one evictee Cameron. Much like the other people in this house, he appears to be completely lacking in the self-awareness department. Raven: Raven is a compulsive liar and easy to dislike. She believes everything Paul tells her and has generally worked for him much in the same way Josh has, but to a lesser extent. You could cite a litany of flaws when discussing Raven, which others on the internet have addressed more fully, so I won't go over all of them here. Her worst moment came when taking part in the forty-minute verbal lashing of Jessica and Cody that took place earlier in the season. Kevin: If there is anyone left in the house to root for, it's Kevin. He's not perfect either, judging by his regrettable comments about Cody, Jessica, and Mark. But now that he's the house's main target, and the one everyone else is bullying, he's starting to see the light. Unfortunately it's probably too little, too late. If he doesn't win HoH on Thursday, his game is over. I want to reiterate to everyone that this is not typically how Big Brother goes. Yes, you often have unlikable people cast on the show, and they often make it to jury. But usually you never have juries so stacked in favor of depravity that it makes you want to avert your eyes. Almost always you'll have someone in the final three who you'd like to see win. This year I'm unsure if that's the case. Let's use BB16 as an example for comparison's sake. Despite the fact that most disliked Frankie, he still made the game more entertaining by being a somewhat worthy adversary to Derrick. He played the game well and wasn't downright vile like some of the BB19 houseguests. Many people were sick of BB17's Austwins alliance, but you never saw them leading a crusade to torment Steve or Johnny Mac. While BB18's Paulie went overboard in his fights with Natalie, you at least had people like James there to try and keep things civilized. In BB19, basic morality seems to have left the building. However you decide to play Big Brother, you can do so without being senselessly despicable to other people. You can be a ruthless player without making it personal. You can be a mean and controversial player without trying to do permanent mental damage to somebody outside of the game. You can win the game of chess that is Big Brother without verbally assaulting your opponent after every move. This year, for some reason, we've seen the evolution of one of the most baneful final eights in Big Brother history. They're so despicable that Cody, who would have fulfilled the "ruthless villain" archetype in any other season, has become this year's hero. I will close with this: in any given season of Big Brother, you might have one or two people as unlikable as those listed above. That the final eight this year have so few redeeming qualities, compounded with the fact that they feed off each other's toxicity, makes this season hard to watch. I would not be surprised if the majority of Big Brother viewers (especially those who watch the live feeds) are unwilling to put themselves through something like this again.